Public Bulletin If playing a full body contact sport isn't for you, the group is also recruiting referees! 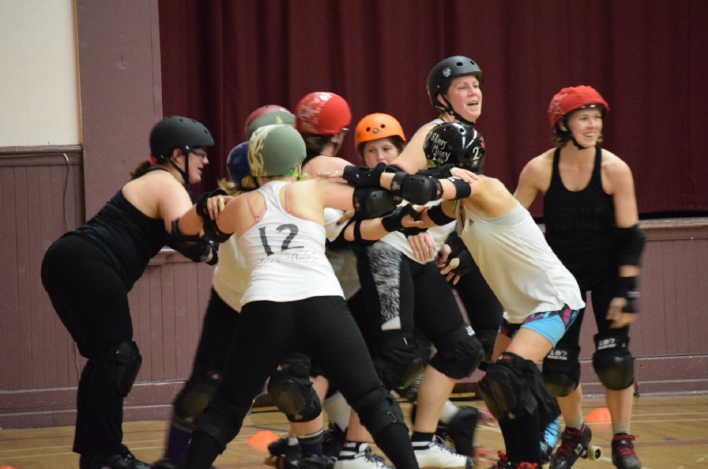 A challenging, full-contact competitive sport with lots of trophies that usually come in the form of bruises, maybe the odd torn ligament, or broken ankles. Some compare the sport to playing rugby, only players are on roller skates, moving around a track counter-clockwise and wearing a helmet, knee and elbow pads and wrist and mouth guards. By day they might be career women, moms and accomplished former athletes in other sports such as figure skating or snowboarding — or all of the above. There are fees as well as insurance and gear costs. Email, or visit their Facebook page to contact for more information! Hours Practice twice/week although places and times change according to location availability. Refer to Facebook page or contact via email.